Description: The famous Rodkey's Flour mill in the background. Description: NS 22A tied down with a nice conist of a H1 BNSF leader and a H2 BNSF sandwiching a NS Dash 9. Description: X-SUPMIT waiting for traffic ahead before getting on the Wayzeta Sub. Description: I do love those H1 Dash9's. Eastbound at Division St. Description: Eastbound, Pasco to Northtown yard. Description: BNSF 7766 is in the hole (on the main) while BNSF 7247 has a light to go. Description: A rail issue up the road has caused BNSF 7766 to be held at Bealville. The tank car in the spur is evidently a casualty from the derailment at Tunnel No.9 in March. 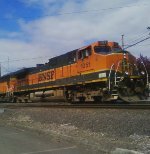 Description: BNSF 1051, 1032 and 7323 head out of Galesburg with out a train. Description: This lite power went up the Peavine. Description: I did not notice this at first but on the nose of the 1051 someone painted over the Santa Fe in the lifesaver emblem.